The dream house of a dancing girl. 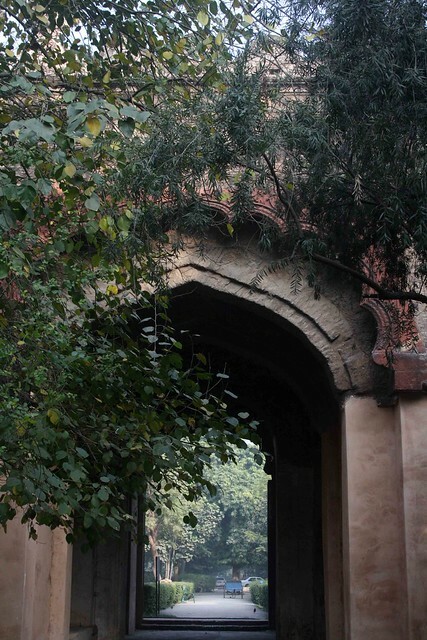 The arched gateway in North Delhi’s Qudsia Bagh conveys the soft outlines of an extinct world. The 18th-century edifice used to open to a walled garden that sheltered a palace. Today, the garden has diminished in size. The Yamuna, which used to flow beside the palace, has shifted its course further east — its place has been taken by Ring Road. 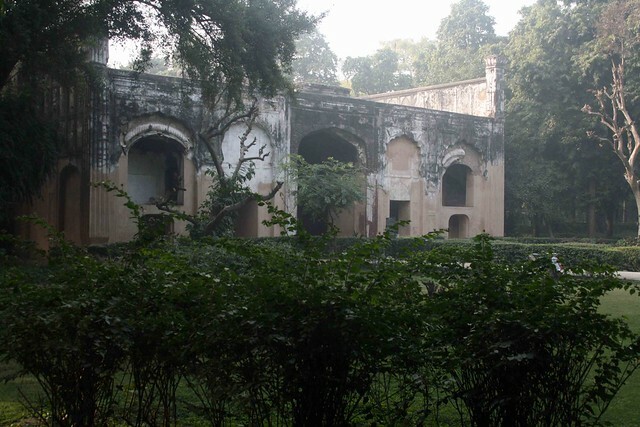 The garden-palace was built in 1748 by Qudsia Begum, one of the wives of Muhammed Shah Rangila, the only Mughal emperor to have his love-making act immortalized in a painting. 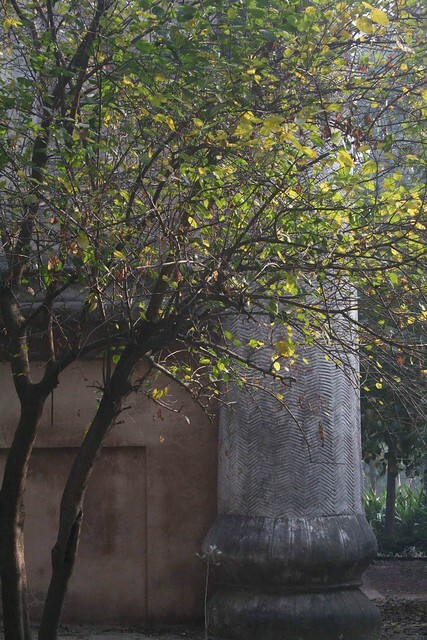 (The Delhi Walla wrote his biography here.) Qudsiya Begum seduced Rangila while she was a dancing woman and was known as Udhman Bai; she later gave the Mughals their next emperor. 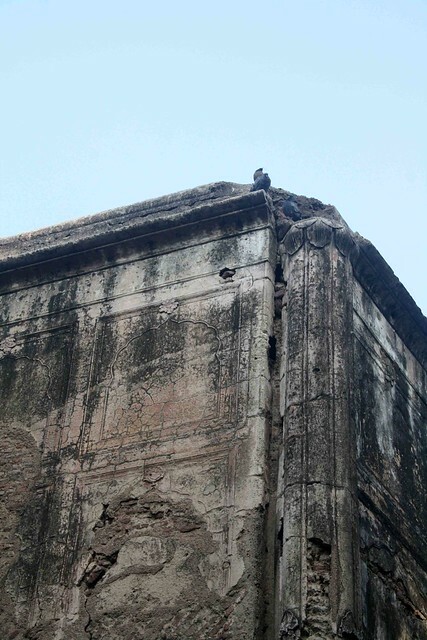 The Begum’s palace was destroyed by the British during the siege of Delhi in 1857. 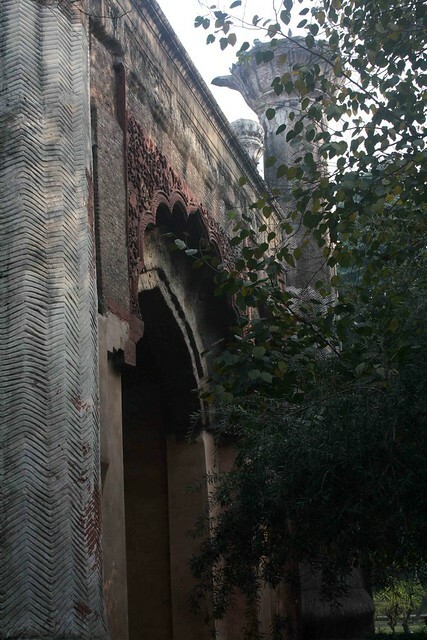 It is reduced to a mosque, a stable and this weather-beaten gateway. 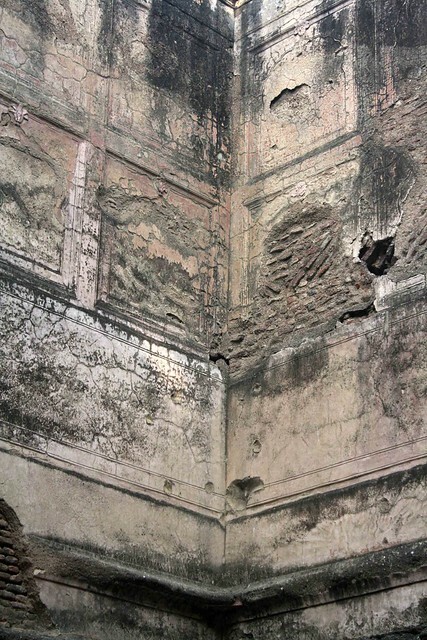 It has massive columns, and is flanked by chambers on two sides. 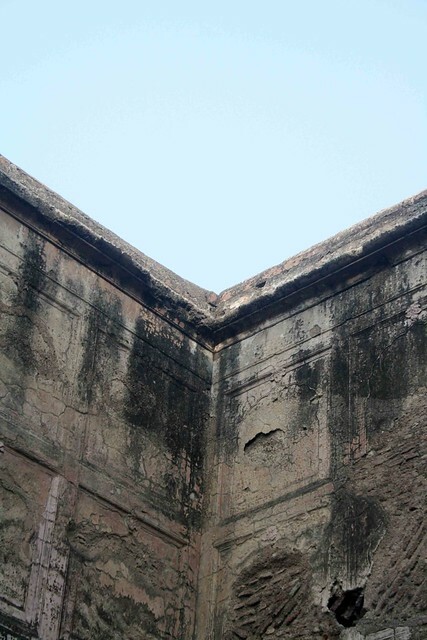 Hundreds of crack-lines criss-cross the surface of the gateway’s thick walls. They resemble the map of a war-torn Balkanised land. 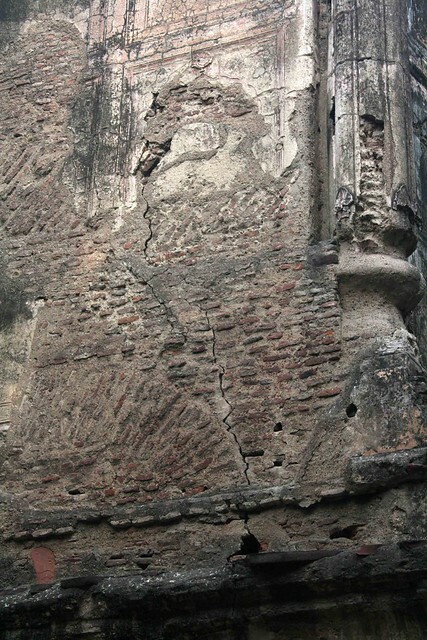 A couple of arch-shapes are also etched along the facade. 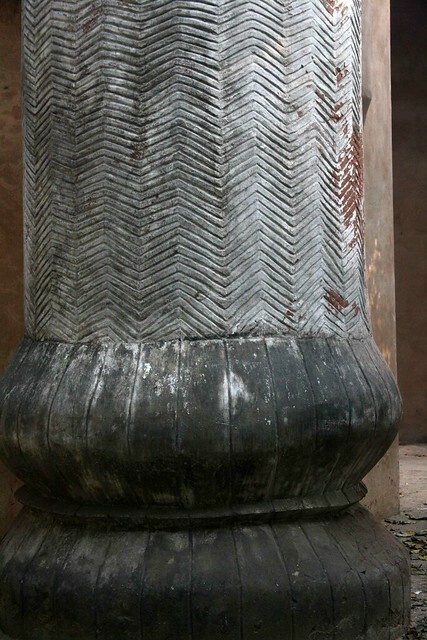 In many places, the outer surface opens to reveal a network of decorative lakhori bricks underneath. 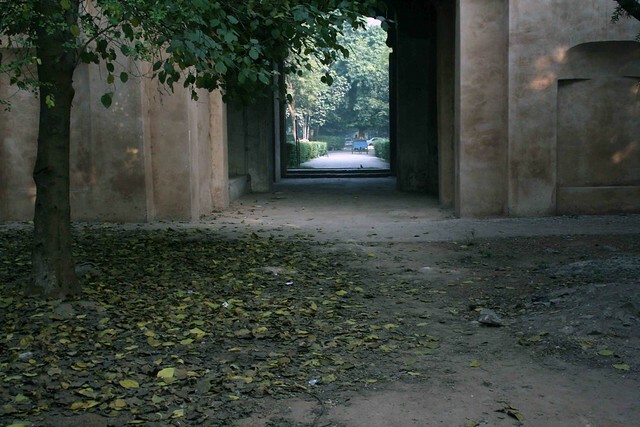 Some of the leaves of the surrounding trees bend towards the gateway, as if they have a fondness for crumbling buildings. 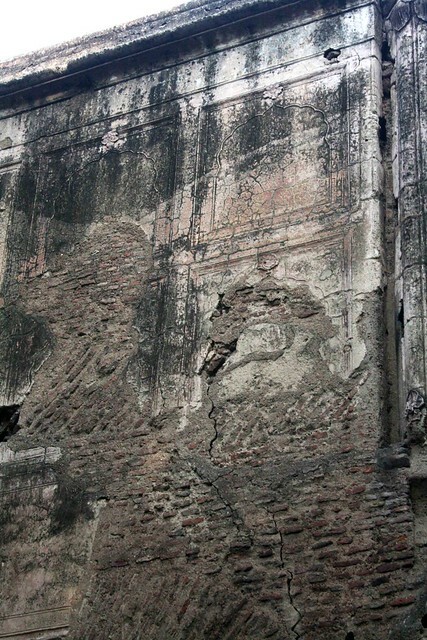 From a distance, the ruin looks as elaborate as the establishment of an affluent courtesan who has fallen to bad times. In winter afternoons, it is shrouded in cold mist and gives the impression of a faded daguerreotype.